Our Harrison Pest Control Exterminator will identify the source of the pest infestation & create a customized treatment plan to eliminate the pests. 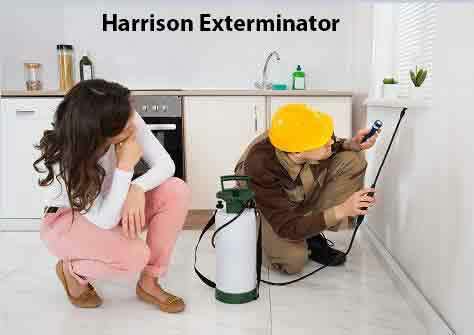 Let us be your Harrison Exterminator that you can Depend On, Give Us A Call Today. 1-844-305-8999. Over this past winter in Harrison NY, many ticks that would have normally succumbed naturally to the extreme cold were protected by snowfall that created a warm micro-environment between the snow and leaf litter. This means ticks, especially the Deer Tick and the Black Legged Tick are going to be out in abundance in all of Westchester County NY. Tick-borne diseases can cause serious illnesses, including Lyme disease. Lyme disease is caused by the bacterium Borrelia burgdorferi and is transmitted to humans through the bite of infected Black Legged Ticks and infected Deer Ticks. If you would like Ticks eliminated from your property, Give Us A Call Today. Our Harrison Exterminator specializes in the elimination of Ticks. Raccoons are among the most widespread mammals in Harrison NY. Rabid Raccoons or Raccoons with Distemper may behave aggressively, act confused, salivate heavily, or have paralyzed hind legs and are active during Daylight Hours. Rabies can be transmitted to humans and other animals by the bite of an infected raccoon. Property damage caused by raccoons is most commonly due to their desire to find food as well as their need to locate shelter. A raccoon will often try to find shelter in attics and other areas in your home or business. If you have Raccoons that you would like removed from your Home or Property, Give Us A Call Today. Our Harrison Exterminator will humanely trap and remove the raccoons utilizing Havahart Traps. Carpenter Bees have become a big problem in Westchester County NY. Carpenter bees do not live in nests or colonies. Instead, female carpenter bees bore circular holes through soft wood on your property or home to lay eggs and protect their larvae as they develop. The male bee is unable to sting. It is the male carpenter bee, which is most often noticed. They hover near the nest and will dart after any other flying insect that ventures into their territory. Carpenter Bees cause extensive damage to any wood structures on your property. If you notice you have carpenter bees and would like them eliminated, Give Harrison Pest Control Technicians A Call Today. 1-844-305-8999.